ABC's analysis of Paul Ryan's RNC address included former Democratic operative George Stephanopoulos citing an a-mail from a "top Democrat" slamming the integrity of Paul Ryan's speech. Stephanopoulos noted "we saw how much this crowd loved it" before immediately adding "I got an e-mail from a top Democrat saying the speech was audacious in its dishonesty." He added in his own words that the speech was "brazen in some of these claims." He has done this before on ABC's Good Morning America, reading Democratic material on-air like an e-mail from the DNC or a tweet from President Obama. 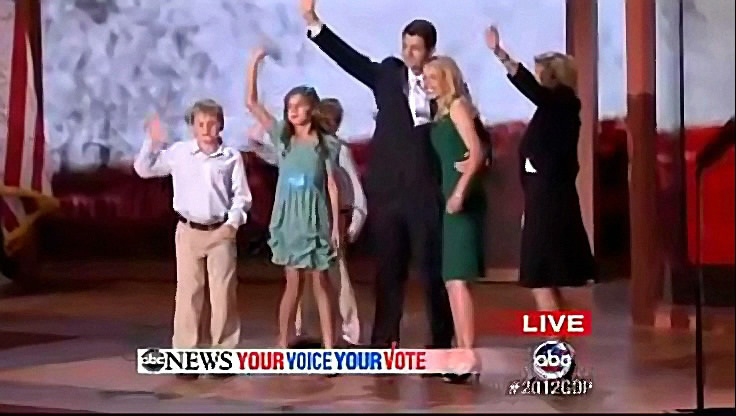 DIANE SAWYER: And there we have him, Paul Ryan. He is the select by Governor Romney for his Vice Presidential ticket, and the crowd really responded tonight, George. GEORGE STEPHANOPOULOS: No question about that, Diane. Energetic delivery by Paul Ryan. It was a broad indictment of President Obama's economic policy. A big gamble, putting Medicare front and center in this debate, and also brazen in some of these claims. I want to get a quick reaction from everybody right here, as he hugs his family. DIANE SAWYER: He is on stage. He's there with his family and he's got his three kids, ages 10 to seven, we're talking to Loaiza, Charles, and Sam. One of them may have nodded off a little, but by the way. Earlier this afternoon they practiced their waves. I love that. They went on stage and practiced. STEPHANOPOULOS: They were going to go out there and practice with dad. Let me go to George Will. Already George, we saw how much this crowd loved it. I got an e-mail from a top Democrat saying the speech was audacious in its dishonesty. GEORGE WILL: Well it was certainly audacious. The sound you heard over the roar of the crowd was the loud slap of a gauntlet being thrown down on the subject of Medicare. Our nation needs this debate, we want this debate, we will win this debate. Four conventions ago, George, at that stage accepting the vice presidential nomination was Paul Ryan's mentor Jack Kemp, who preached against root canal politics, against green-eyeshade conservatism. He was the apostle of sunny conservatism. Paul Ryan is saying you can be a sunny conservative while trimming entitlements. It's a good trick. STEPHANOPOULOS: You bring up the 1996 convention, Donna Brazile, that was also a race where Democrats attacked Republicans for cutting Medicare. DONNA BRAZILE: Absolutely, George. And tonight Paul Ryan gave us a litany of things that they disagree with President Obama, but he did not offer the country anything that Mitt Romney or Paul Ryan would do to fix the problem. After adding more than 6.8 trillion dollars to the deficit under his congressional leadership, now he's saying that Obama failed but he has now given us a plan for what they will do for the middle class. STEPHANOPOULOS: But Matthew Dowd, he did do exactly what Mitt Romney expected him to do tonight. MATTHEW DOWD: Absolutely. I actually think for the first time he was on the national stage, he performed extremely well, the first time to stand on that stage. I also think it prepares us for how he's going to take on Joe Biden in the debate. I think his best moments were when he basically said you younger voters who believed in Barack Obama, and are disappointed, it's okay now to come over to our side. STEPHANOPOULOS: The fading Obama poster on the wall. DIANE SAWYER: Staring up at the fading Obama posters on the wall. And those vice presidential debates are on October 11, we should point out. Not far away. Let's go to Jonathan Karl down on the floor, he covers Paul Ryan. He's covering the entire vice presidential race for us. Jon? JONATHAN KARL, ABC News senior political correspondent: I've got to tell you, Diane, as far as this crowd is concerned, an absolute home run. I have been on the floor of the convention for all the big speeches, none remotely like this. This crowd more electrified, more captivated by what he said, and I think you have a new slogan here: "We can get this done." That's what they were reacting to, they loved Paul Ryan tonight. STEPHANOPOULOS: And they were reacting also Diane, as George Will said, the gauntlet has been thrown. SAWYER: That's right, and it is on to tomorrow night. Thursday night, and Governor Mitt Romney will be here for his speech and so will we.